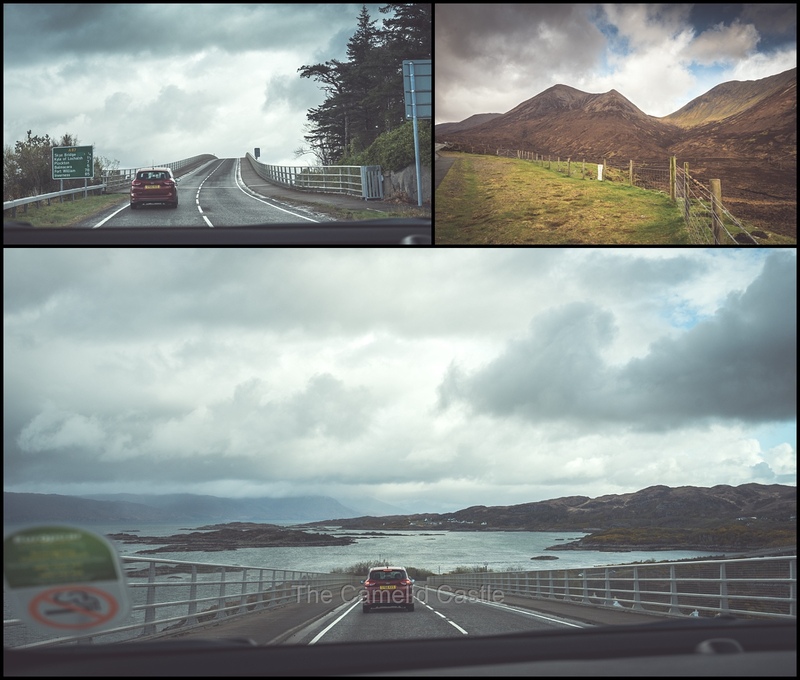 Our final full day in Scotland was one full of driving, and some spectacular scenery. We had to bid farewell to the beautiful Isle of Skye and wind our way South back to Glasgow, on the way stopping through Dornie, Fort William, Glen Coe and Loch Lomond. 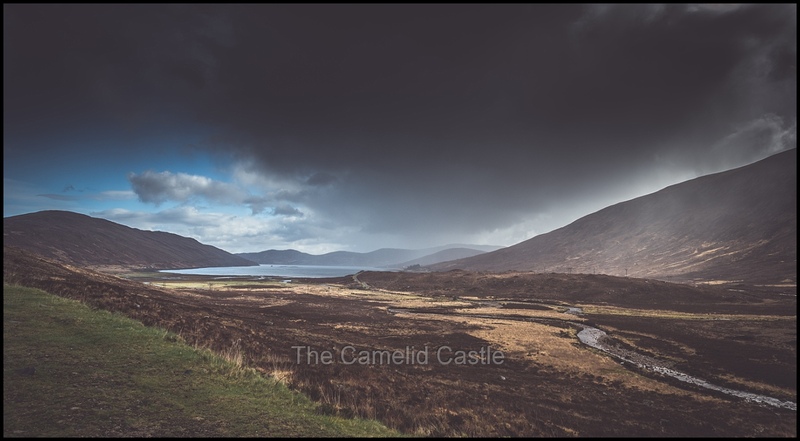 There was plenty of amazing sights and an interesting array of very Scottish weather too……. For some unknown reason (maybe to torture their parents?) 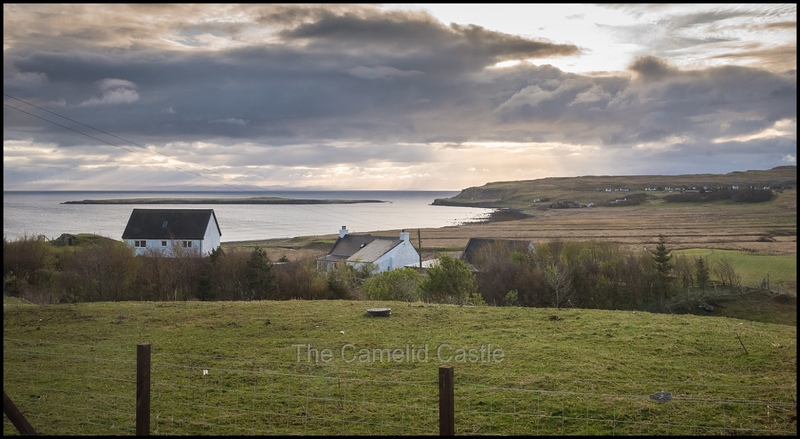 the kids decided to wake up at 5am, despite the super comfy beds and quiet of our seaside cottage in the Isle of Skye. Of course none of us managed to go back to sleep properly and at 7am we gave up and decided it was time for coffee and breakfast. We did manage to see another lovely sunrise over Staffin beach from the big windows in the cottage. We had woken to a fairly decent day of weather (so far), and were rather disappointed that we couldn’t use it to do much exploring of Skye as we had over 6 hours of driving to get back to Glasgow, not taking into account any stops. After breakfast we tidied up the cottage and packed the car while the kids ran around with the sheep in the cottage paddocks, and we admired the view while it was actually sunny! 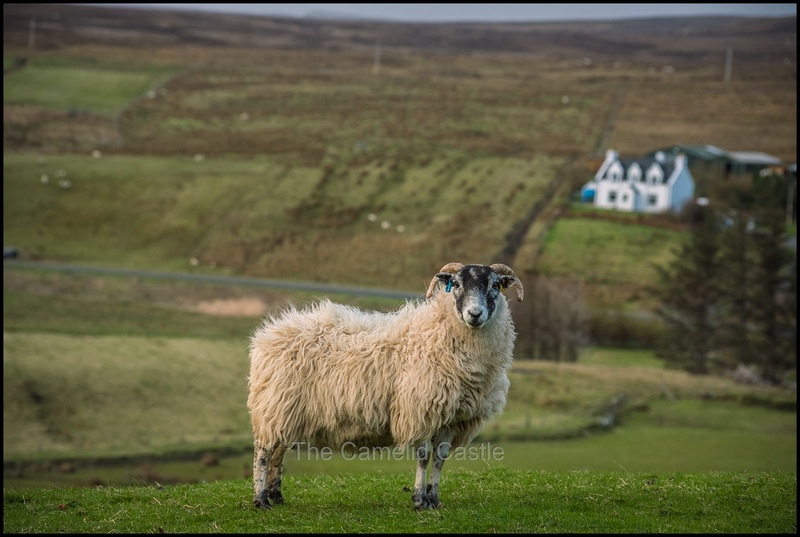 We would have loved to stay another few days in Skye, but alas, we’ll just have to come back! Due to our early start to the day we were easily on the road by 9am. 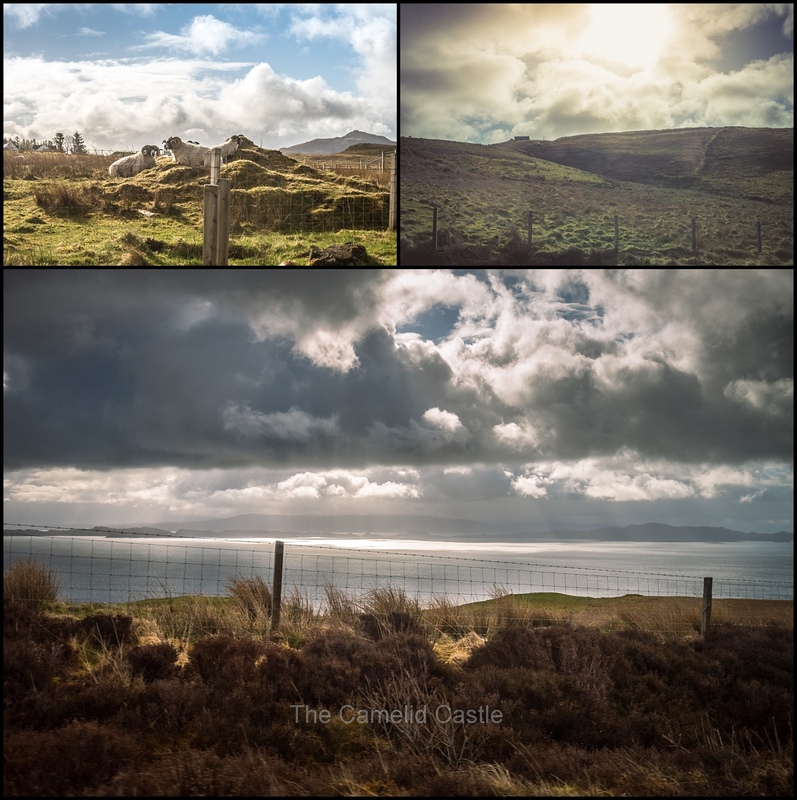 Given the weather was a vast improvement on the pouring rain and near zero visibility of our trip North through Skye on the day of our arrival, we were hoping to see more of the countryside on our drive back out. 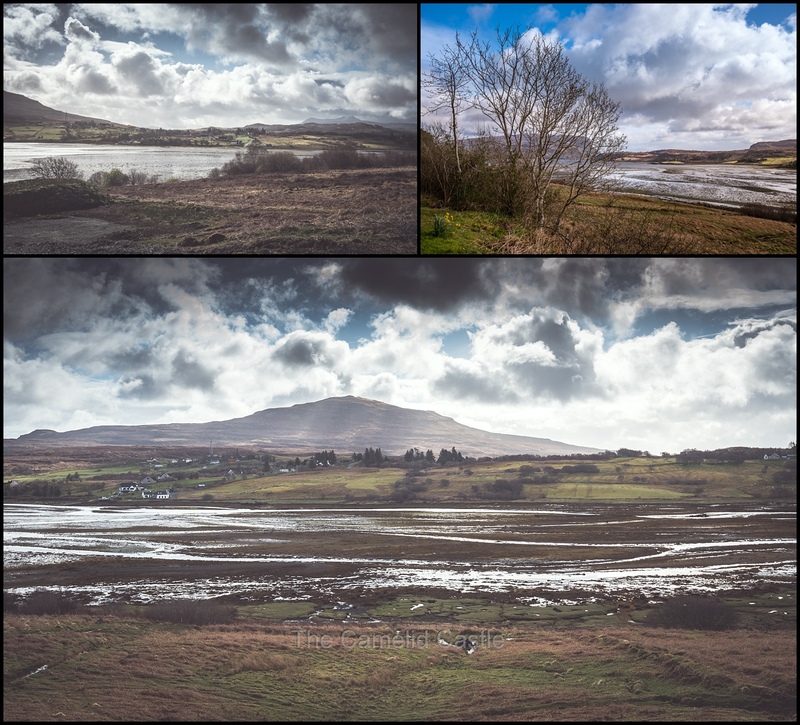 The weather held out as we drove South and we got to see some spectacular scenery. Unfortunately there were very few stopping places and often single lane road, so not many photos. 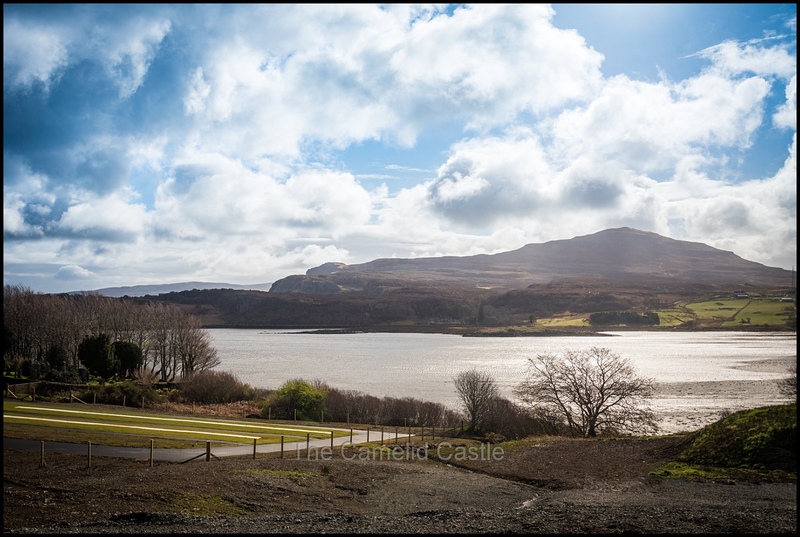 We had planned to make a brief stop in Portree, but couldn’t get a park anywhere so had to keep on driving and admire the views from the car windows. In true Highlands fashion we did find plenty of sheep and cows both on the road and near the roads for us to say hello to! We made fairly good time on our journey off Skye and pretty soon we were approaching the Skye bridge once again. There had been intermittent light rain but we could still see the amazing mountain and ocean views. An hour and 10 minutes after we had left the Staffin cottage we were over the Skye bridge and back on the mainland. This about where our luck with the weather ended. It immediately started pouring rain, making driving somewhat difficult. 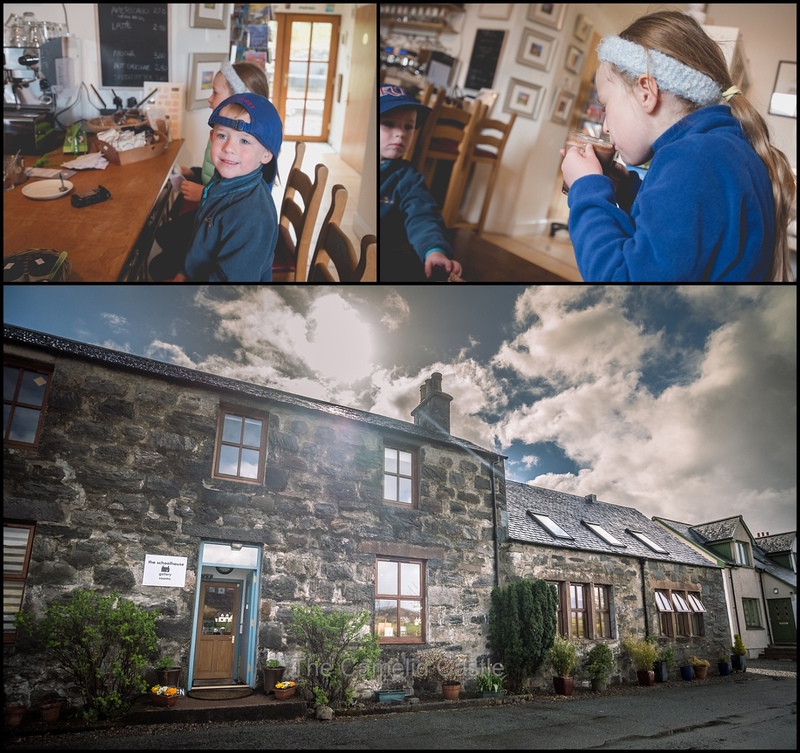 We decided a coffee break was in order so pulled into a gallery cafe called ‘The Schoolhouse’ in the town of Dornie. It had both great coffee and a cute gallery. We stayed just long enough to warm up and for the rain to stop. 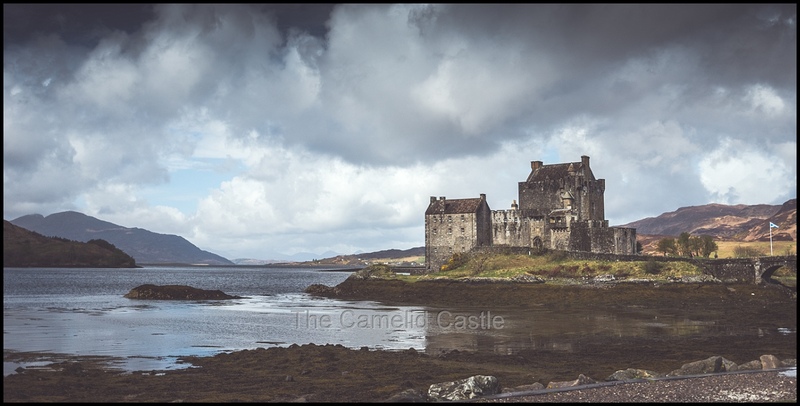 It was time to get back on the road and we drove past the nearby Eilean Donan castle. 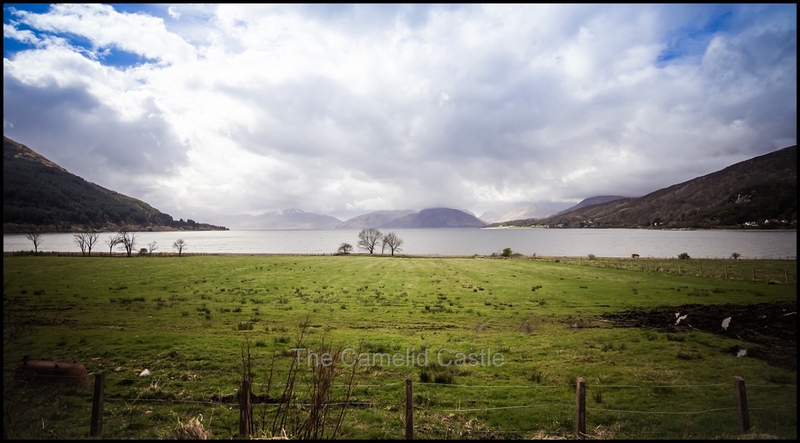 We would have liked to have visited the 13th century castle, one of the most iconic images of Scotland, but with a tight timeline (and it was already crawling with tour buses) we decided we’d have to make do with the views from the car park and return on a future visit. 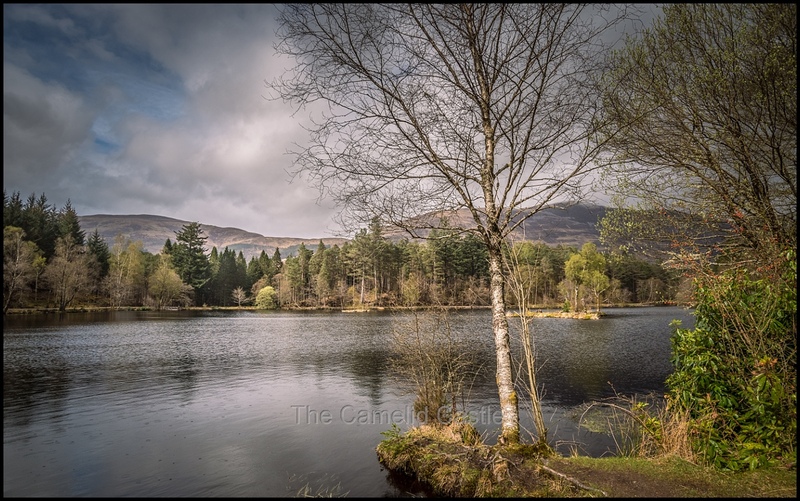 As we drove towards Fort Augustus it continued to rain on and off, resulting in plenty of grey and misty lochs viewed through the car windows. 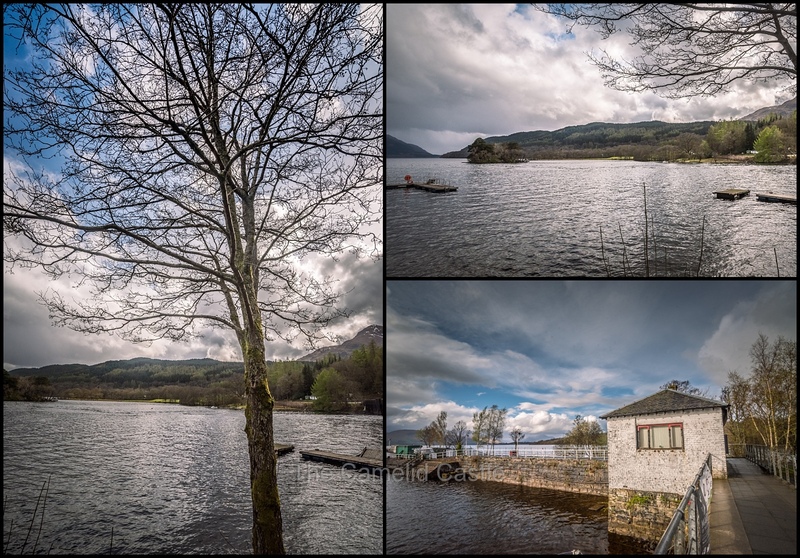 We’d been thinking of stopping in Fort Augustus for lunch, but the kids had just fallen asleep…….. and it was only just after 12pm when we made it to there, so we elected to keep driving. Our driving route had taken us back past the other end of Loch Ness to where we had been several days earlier, before heading to the North West. But with sleeping kids and nowhere to conveniently stop we decided it wasn’t a good day to have another hunt for Nessie. We decided to make Fort William our lunch stop as we were rapidly tiring of driving in grey in miserable weather. 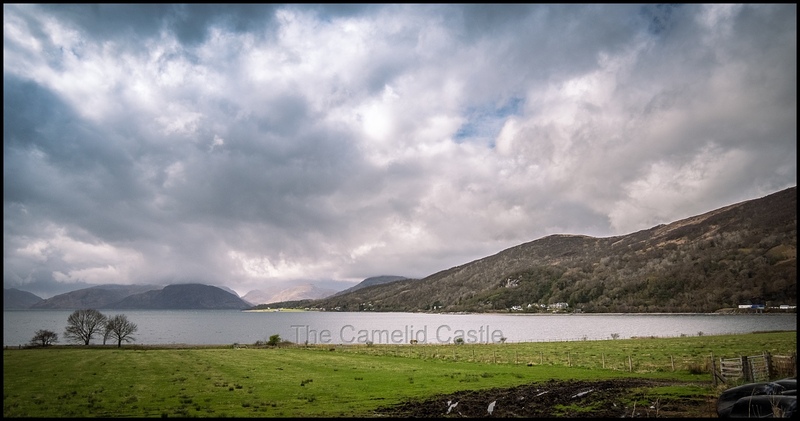 The kids had woken up not long before we made it to Fort William, about when we got hit with another torrential downpour, making it impossible to spot Ben Nevis, the highest mountain in the British Isles, which sits close to the town of Fort William. We’d stopped pretty much opposite Ben Nevis to get some petrol, but nope, we couldn’t see a thing other than grey, sleeting rain! Luckily it had again stopped raining by the time we made it into town. 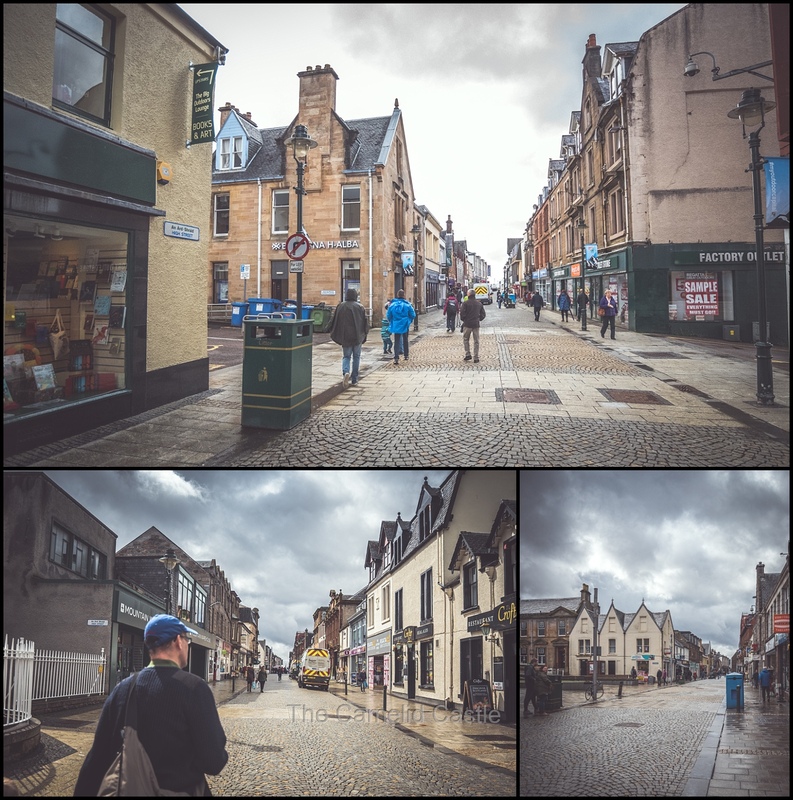 It was now about 1pm so we found a park and went for a little explore of Fort William in search of lunch options. There were plenty of places to choose from and we chose a pub that had plenty of decent food options. 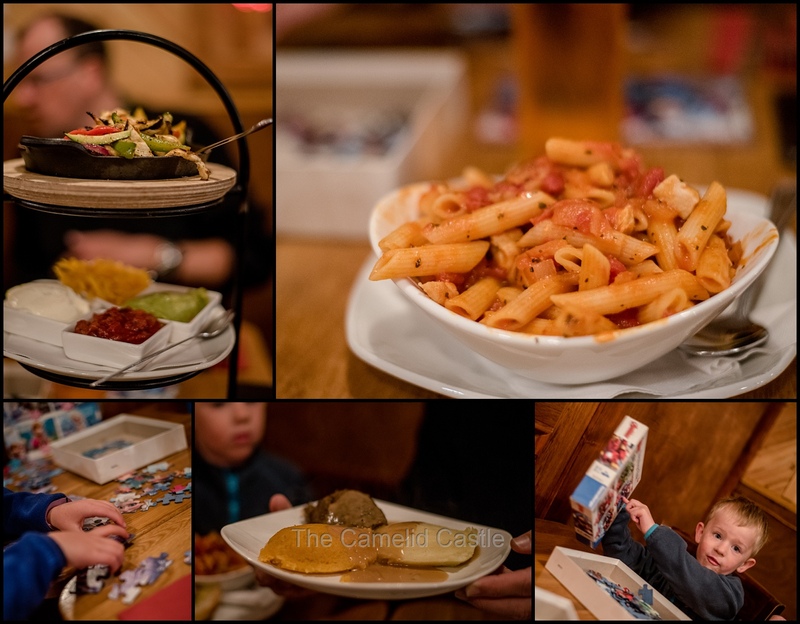 The kids were thrilled that they gave them puzzles to keep them entertained while our food arrived. Soren had decided on a break from fish and chips and ordered a tomato, basil and chicken pasta with garlic bread. Astrid had a burger with chips and salad. Anto decided to celebrate the conclusion of our Scottish adventure with haggis with ‘neeps and tatties in a Drambuie cream sauce and an irn bru to drink. I went much less Scottish with Veggie fajitas. Which turned out to be a massive and tasty meal! The kids were content to stay in the warm pub all day doing puzzles but we had to hurry them along and bribed them with a quick visit to a souvenir shop for some last-minute Scottish goodies. We made it back into the car before 2pm, with a short drive ahead to our next planned stop in the village of Glencoe. 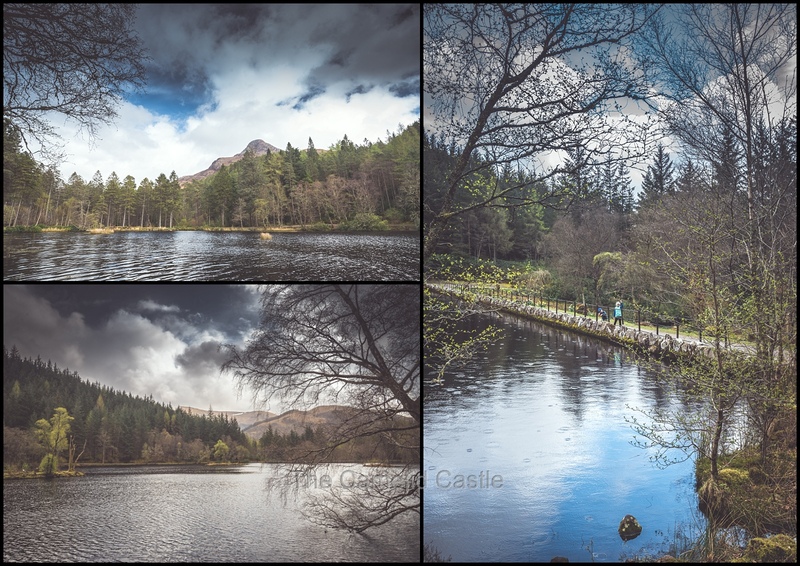 Our research had led us to some easy and short walks around the Glen Coe lochan. 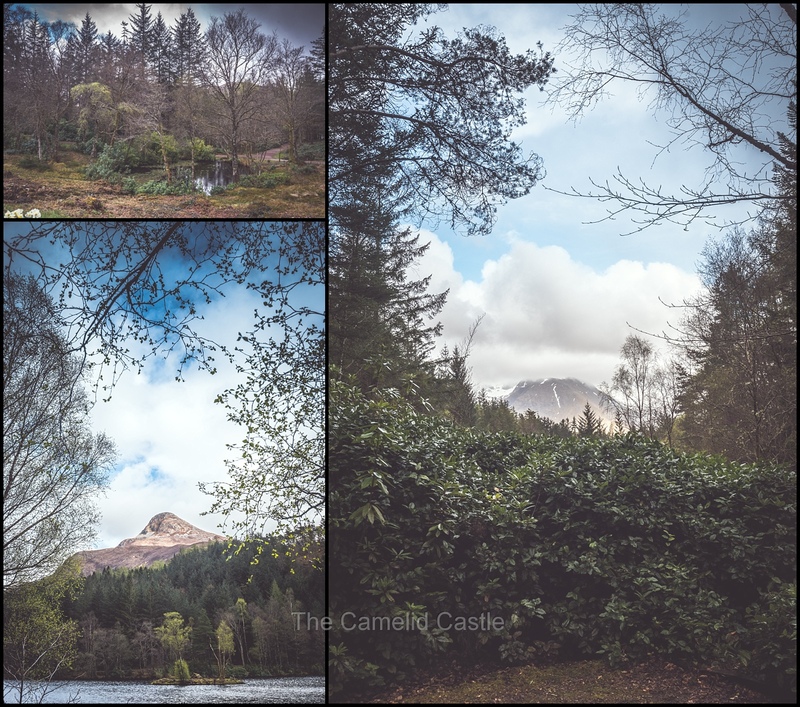 The walks follow waymarked trails through ornamental woodland at the foot of Glen Coe. 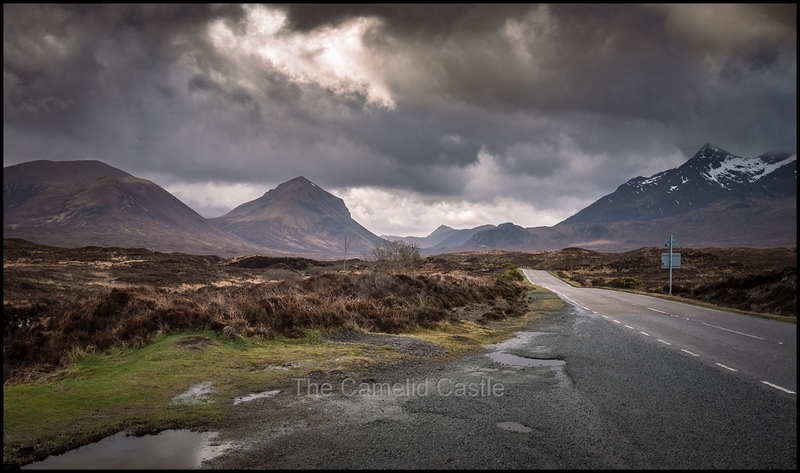 Glen Coe is known for it’s wild and dramatic mountains, through which the A82 motorway passes. 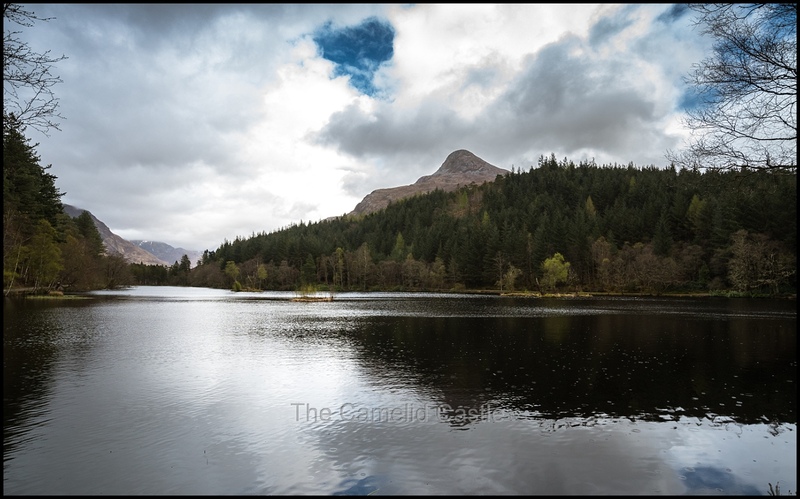 You can see many of the mountains of Glen Coe from the picturesque and quiet lochan at the foot of the mountains. The car park was pretty much deserted and we were all keen for a leg stretch. It was not currently raining but we rugged up with coats on, just in case, and headed for the marked trails. There were several (colour coded) options and we picked one of the flat routes that was supposed to be scenic and take between 30 and 60 minutes. As we set off around the wooded lochan it was very windy but it was an easy walk on the wide trails. The kids took off enjoying the run past plenty of friendly ducks, while the adults admired the views. There was plenty of fog covered (and still partly snowy) mountains and the views across the lake with the mountains rising sharply in the background were pretty. We came across another group of young kids and they all ran together, meaning we completed the loop in 18 minutes and had time to explore a section of one of the other marked trails. If we had more time we would have liked to do some of the other highly regarded walks in the area, but alas there was still plenty of driving to be done. Just as we made it back to the car park, the light spitting rain got significantly heavier making more driving seem like the much wiser choice. 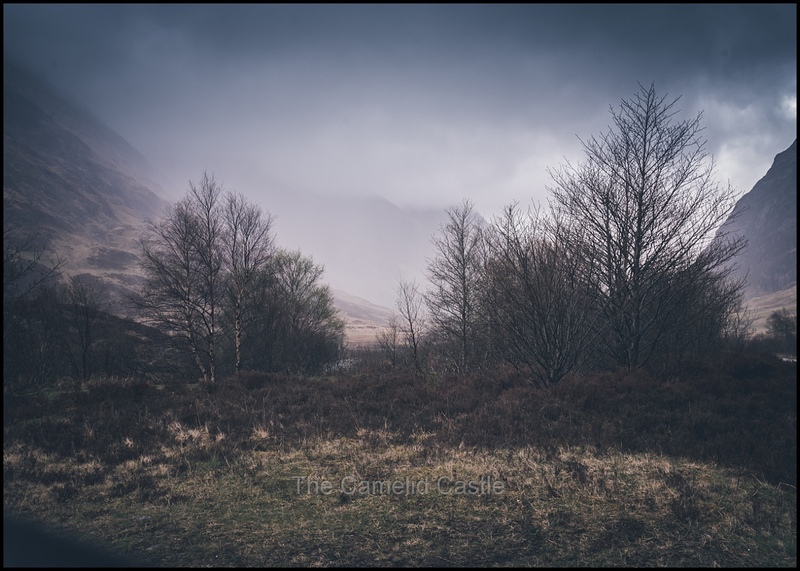 By time we were all in the car it was absolutely pouring with rain, making our planned stop and wander through Glencoe village, located at the foot of Glen Coe, on the way out impossible. 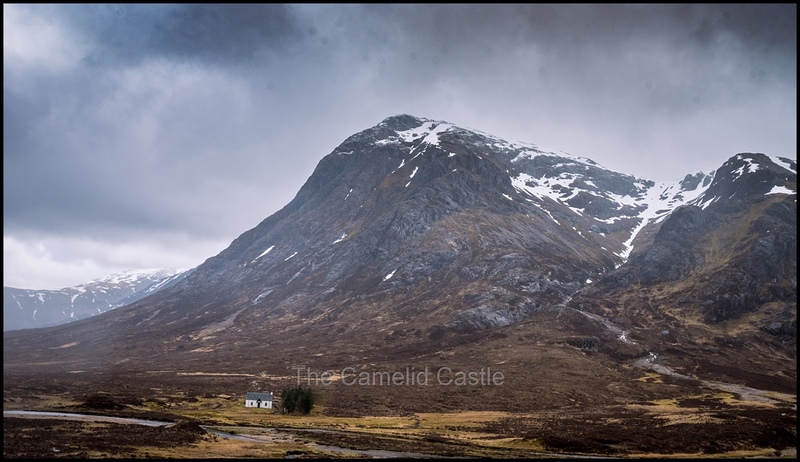 I had been very much looking forward to our drive through Glen Coe on our journey towards Glasgow. The deep valley and towering mountains of Glen Coe were carved out centuries ago by icy glaciers and volcanic explosions. 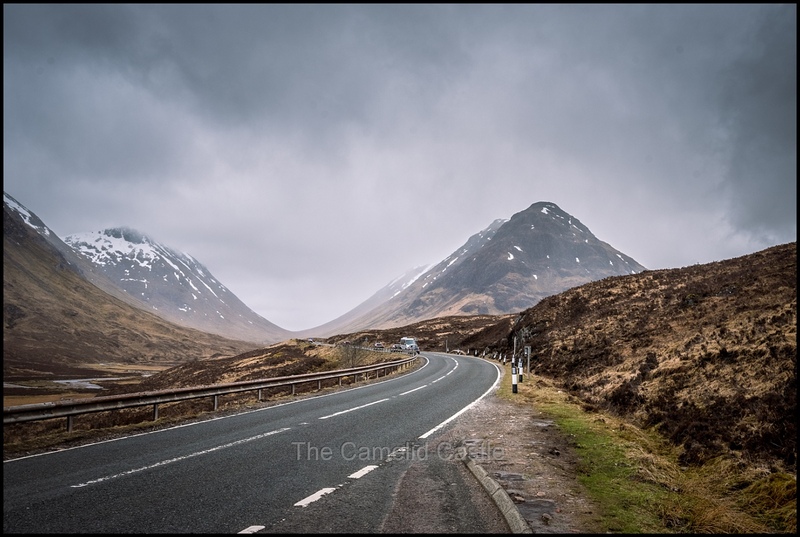 The drive along the A82 through Glen Coe is known as “one of the classic Highland journeys”. 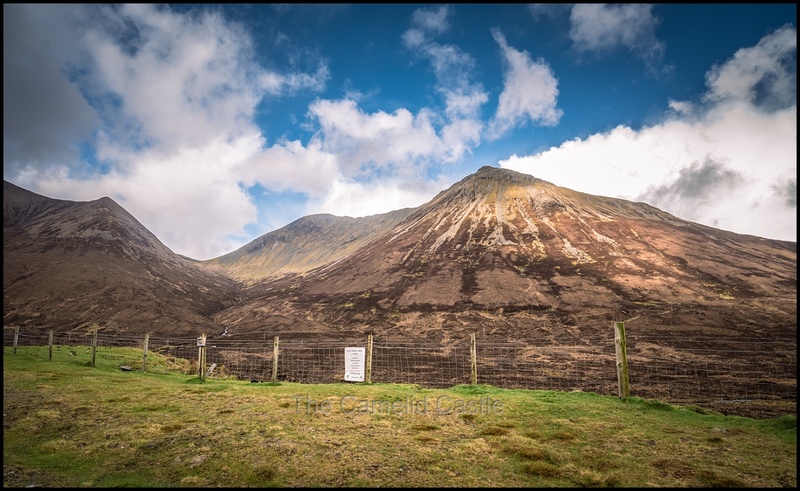 The glen is regarded as the home of Scottish mountaineering and is popular with hillwalkers and climbers. Our drive through Glen Coe was spectacular but made very difficult with torrential rain and high winds for much of the trip. There were plenty of places to pull over for scenic views and I’d get out of the car while Anto and the kids huddled inside, trying to get a few decent shots of the impressive steep-sided mountains, still covered in snow. Every time I got drenched, the car door nearly blew off, and my camera that had survived some pretty terrible conditions in Iceland was even having trouble focussing in the grey and heavy rain! 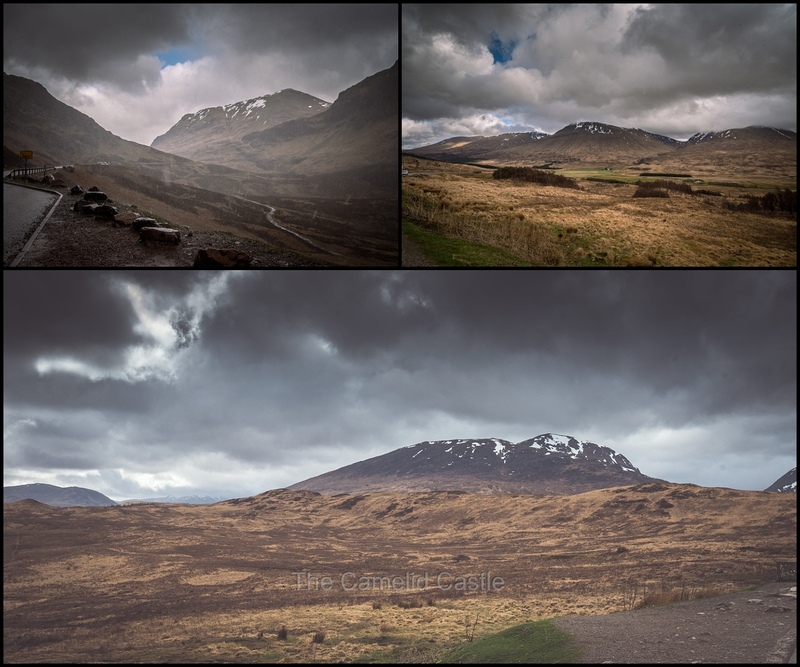 Despite the terrible conditions I had to at least try to get a few shots, but we ended up viewing most of Glen Coe from the safety of the car. The road winds its way along the 12.5km length of the U-shaped Glen, which is only around 700m wide at its base and narrowest at the pass of Glen Coe. Glen Coe is named as the River Coe runs through it and ‘glen’ is the Scottish term for a deep valley in the Highlands that is “narrower than a strath (a river valley that is wide and shallow)”. Even with the terrible conditions we saw plenty of people out attempting to hike some of the mountain trails (and looking miserable). Car sightseeing seemed the better option today, but it is definitely on the list for a return visit at some stage, hopefully with some better weather. As we left Glen Coe we had a very wet but scenic drive past Rannoch Moor and down to Loch Lomond. We had a quick toilet and leg stretch stop while we grabbed a take away coffee in a roadhouse not far from the loch. 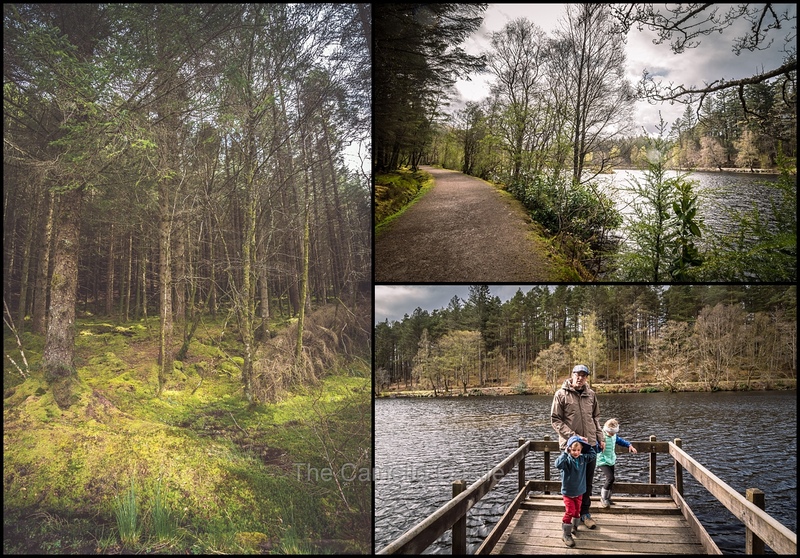 We had originally hoped to do walks around Loch Lomond park, but both time and weather were against us. 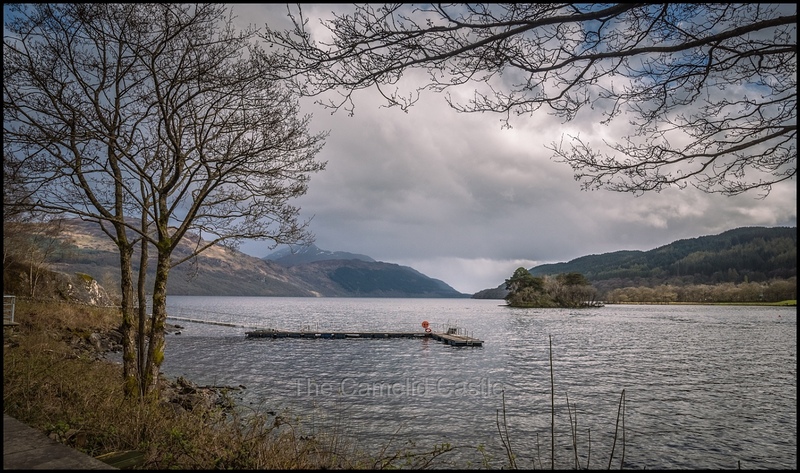 Loch Lomond is traditionally known as the border between the Highlands and lowlands of Scotland and the loch is the largest inland stretch of water in Great Britain by surface area. 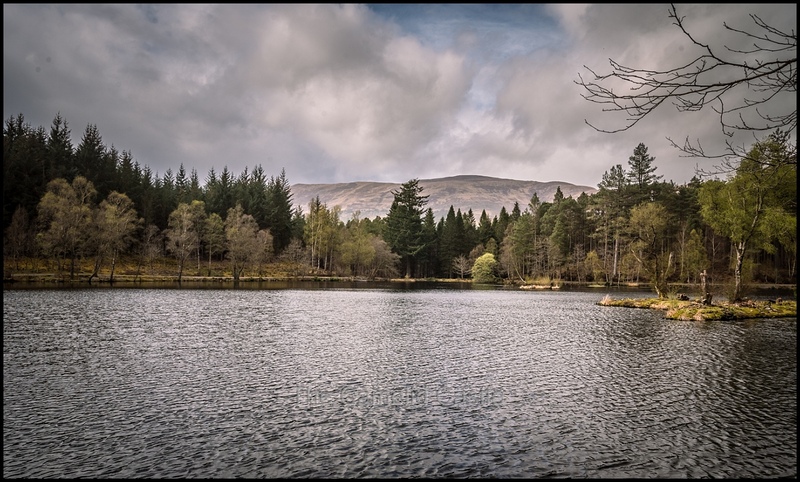 The loch is almost 37km long and the highway travels adjacent to the loch for the majority of the journey into Glasgow so we made a few quick stops for photos along the way. 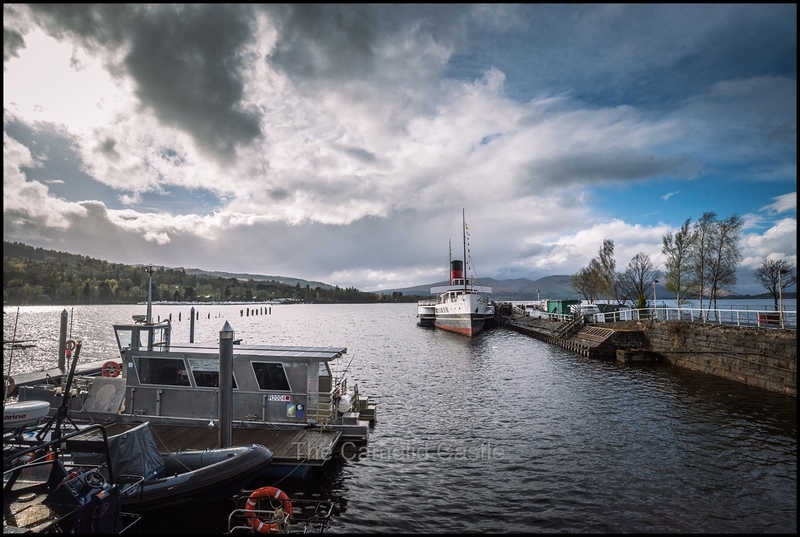 We reached the end of Loch Lomond by 6pm and decided we should grab some dinner before heading to the airport and our hotel for the night (the…. ) . After my massive veggie fajita lunch I still wasn’t hungry but we figured that the kids needed to eat and we had a long day of travel ahead the next day. The Glasgow airport is a reasonable distance from the city area. Our week in Glasgow earlier in the trip we’d been staying in an apartment in the central city area but had decided to stay near the airport for convenience before an early departure to Romania the next day. We found a pub the ‘Craig Dhu’ in Paisley, a suburb near the airport, that had OK reviews and we could actually park near. Once we were off the motorway, driving through the suburbs in a mass of one way streets was time-consuming and frustrating after an already long day in the car. By 6.30pm we were at the pub and the kids had decided on pizza for dinner and then were told it wasn’t available so settled on sausages, beans and chips. I had a mushroom ‘pie’ with veggies and the compulsory chips (every Scottish meal seemingly comes with chips). Anto had haddock and chips and peas. Peas count as a vegetable, right? Even though we weren’t that hungry it was fairly tasty food and the kids convinced us they needed dessert of brownie and ice cream to share. While our last dinner in Scotland wasn’t super posh even with drinks the bill was only 18 pound, we were back in cheap Glasgow after some pricey days in the Highlands. It was now almost 7.30pm and it was back in the car for the 10 minutes to the airport (about 2 miles away). and checked into the hotel (which was right at the airport) and found our room. By this stage of a very long day the kids were totally losing it. Our hotel room was absolutely tiny and we could barely walk around the beds without turning sideways or crawling over them. So I was juggling all our suitcases and getting everything organised to get the kids showered and to bed while Anto stripped all our stuff out of the hire car and returned it. The kids finally gave in to sleep and we had to somehow use the limited space to magic everything back into the few suitcases from all the various bags that we’d filled the car up with before our morning flight to Romania, keeping under the weight limits for the flight. Daily statistics for Wednesday the 25th of April 2018 in the Isle of Skye, the Scottish Highlands and Glasgow, Scotland – the temperature started out at a mild 5 degrees in the Isle of Skye. 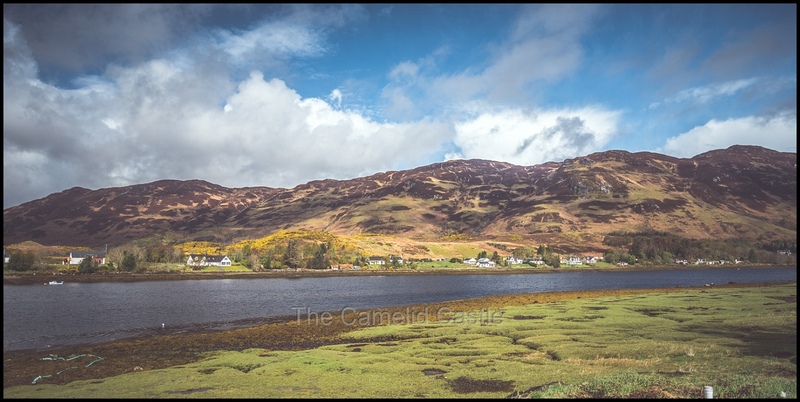 As we headed south through Dornie, Fort Augustus, Fort William and Glen Coe it varied between 8 and 11 degrees with intermittent and often torrential rain. We finished the day in Glasgow at 12 degrees and partly cloudy. The total walking for the day was a pretty average 5.4km. Given we’d spent most of the day in the car, and the weather had conspired against any of our planned longer walks it wasn’t an awful effort. Speaking of driving it was a very long day with the drive down from Skye back to Glasgow airport, via various tourist stops. The estimated driving time was around 6 hours and it was slightly longer with a few detours. The total distance was a little over 242 miles or 390km, on sometimes single lane roads in rainy conditions. Here is our driving map for the day, as you can see we travelled some distance! Up next, we leave Scotland and fly East to Bucharest, Romania, arriving to some hot and sunny weather, a shock to the system! Our first couple of days in Bucharest involved plenty of tasty food and the enormous Palace of Parliament, the second largest building in the world………. 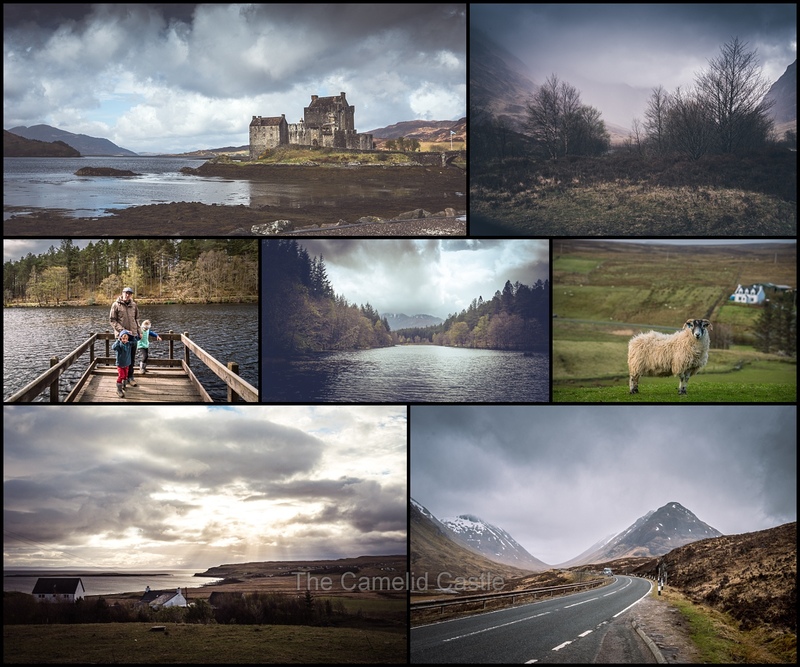 Posted in 4 years, 6 years, Anto, Astrid, Castle, Dornie, Fort William, Glasgow, Glen Coe, HIghland Cow, kids, Loch, Scotland, Scottish HIghlands, sheep, Soren, Staffin, Travel, travelling with kids, UKBookmark the permalink.